This past weekend I watched one of my closest friends get married. I stood beside her in a large bridal party and still I felt privileged to be included. She is the type of girl that everyone loves and she has very few, if any, enemies. I, in fact, can’t even think of a time that her and I ever got into a fight. She is so easy going, never petty, and the type of person who is down for anything. We have been friends now for more than ten years; have lived together, experienced hookups and breakups together and all kinds of other drama. Both social creatures, we always make it a point to have some time alone together whenever we see each other. And even if we go awhile without talking, we can always pick up where we left off.We have gone through the ups and downs of engagement together, and in seeing her so happy on her wedding day, I couldn’t help but cry. I never really cried much at weddings in the past, but I think the combination of it being someone so close to me and being so close to my own wedding really hit me hard. It all seems so real now. Because although I wasn’t the type of girl who dreamed up every detail of my wedding day, I definitely thought about it. Society sets it up that way somehow. 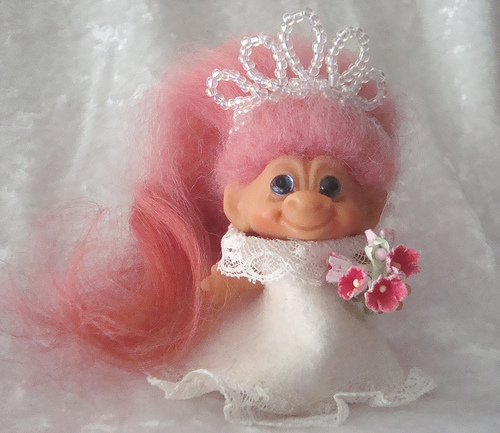 I would make my Barbies date, loved playing the Game of Life — I even have a bride troll. I don’t believe in this day and age that this is pushed on youngin’s the same way, but there is something there still that makes little girls say “one day, I’m going to get married,” and not understand what that really means. Men are actually better at understanding this somehow. Men get the commitment factor better than women do. Women often see a ticking clock, see everyone around them tying the knot, truly want to be in love and want that love to be everything that they fantasize about — nights under the stars, rose petals on the bed, surprise love notes, butterflies until the end of time. These fantasies start at an early age with girls and they never truly let go of it. And while these things are nice, they just don’t happen everyday, and if they did, would they still be special? Not everyday is going to be heaven, that’s why you have to cherish the special moments as they happen, and that’s what my friend was doing. She embraced her moment to the fullest, didn’t let anything bother her, and she so deserved the perfect day she got.